I came across this article on MSN.com titled "A Top Dermatologist's 5 Best Anti-Aging Tips". The dermatologist, Diane C. Madfes, is an assistant clinical professor at Mt. Sinai School of Medicine in NYC and a spokesperson for the American Academy of Dermatology. I found her 5 tips to be straightforward, honest, and most importantly, realistic! Below I have listed each tip with a paraphrased description and of course, my personal commentary. Hopefully these tips will help prevent this! TIP #1: Focus as much on what you put in your body as on what you put on your skin. A vitamin D supplement, 1,000 IU's per day (although everyday sun exposure is typically all you need for your body to make it's own vitamin D). Eating omega-3 and omega-6 fatty acids. Ideally these should come from natural and/or nutritional sources such as olive oil, ground flax seed, and fish such as salmon. Fish oil supplements are a great option, but make sure you buy the "no burp" kind or else you'll experience a fishy aftertaste! Increasing these FA's will help protect your skins moisture barrier, the protective outer layer that keeps moisture in, but tends to thin as we age. Cut WAY back on sugar and processed foods. These cause inflammation which is damaging to the skin and impairs the healing process. Drink more water - all day long! 1 liter per day is a good starting point, you may include coffee and tea in your daily totals, but limit wine. Of course wine contains beneficial antioxidants, but it also dilates blood vessels which is NOT beneficial for your skin. TIP#2: Halve your sun exposure. Daily SPF. I use a daily moisturizer with SPF 30 everyday, even when I'll be inside all day (don't forget your neck and ears!). Its a good habit! There are many great options by brands like Neutrogena, Olay, and L'Oreal, just pick one. If you are going to the beach sunblock is a MUST. Use a shot glass amount (I KNOW you all can estimate that!) of sunscreen with a SPF of at least 30 on all exposed parts. Apply at least 15 minutes prior to sun exposure, I find that to be very helpful! Know that older skin tends to be more vulnerable to the effects of the sun than younger skin. If you tend to forget sunscreen, try the newish makeup and dailf facial moisturizers with UV-protection built in. On the downside, you might not get the optimum amount of SPF, but Madfes says that the plus for many women is that at least they remember some protection every day - which is better than going without. Walk on the shady side of the street. I have a hard time doing this, its cold over there! Wear UV-protective clothing. A host of new apparel blocks UV rays while wicking away moisture, making these clothes especially good for outdoor exercise. Exercise outside in the early morning or late afternoon. If you can, avoid sun between 10 a.m. and 4 p.m., when UV rays are most potent. Ask a doctor about prescription-strength retinoids. 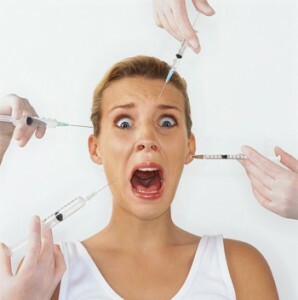 These include tretinoin (Retin-A, Renova, Avita) and tazarotene (Tazorac, Avage). Some insurance plans cover the cost. Follow directions carefully. Usually, starting a retinoid involves a gradual introduction of the product to avoid irritation. Eventually, most people apply it just once a day. Use a moisturizer on top of the retinoid, or use a moisturizer that contains retinoid. Know that retinoids aren't recommended for women who are pregnant or breastfeeding. TIP #4: Spend time - not necessarily money - on a smart AM/PM skin care routine. Remove all makeup and wash your face before you go to bed. All day, your skin is assaulted by chemicals in the air that break down collagen and cause other damage. If you don't clean your face, your exposure to these pollutants will continue all night long, too. After cleansing, apply a retinoid and then a moisturizer — and sleep on a clean pillow (don't go weeks before you wash it). Something people commonly look over! TIP#5: Pick cosmetic procedures that also help skin regenerate. Try peels. Exfoliating can make skin look brighter (can be mechanical exfoliation, scrubs/wash cloth, or chemical exfoliation, peels/AHA's). This is because the turnover of cells grows slower as you age. Microdermabrasion is a less expensive option, but the results do not last as long as a peel. A chemical peel is a deeper process that does the same thing while also stimulating collagen growth. Regardless, diligent sun protection must be used after either procedure. Find out if you're a candidate to resurface your surface. If the top layer of skin is looking brown, with a rough texture — hallmarks of sun damage — a relatively new procedure called fractional resurfacing can actually reverse some of the damage by increasing collagen production. Done with lasers in a doctor's office, resurfacing can improve skin texture while minimizing wrinkles, sun spots, and acne scars. This procedure can create visible improvements in patients who have significant skin damage. Use this knowledge to your advantage! Thank you!!! This was exactly the information I needed! Thanks for the review. This is really very helpful and informative post.I like it.It help us to full service offered for ladies online shopping buy skin care products Online.